Get all of your statements electronically and get rid of the paper clutter. We offer a wide range of lending services to fit your needs. Access your accounts on the go with our mobile banking service. Available Now! Randall State Bank is proud to serve our many customers as a bank and neighbor. We offer Personal and Business accounts as well as Investments and Mortgage services. So stop on by and learn why "We're large enough to serve you, and small enough to know you." Fight Fraud with SHAZAM BOLT$. Learn more here. Meet our dedicated staff by clicking here. 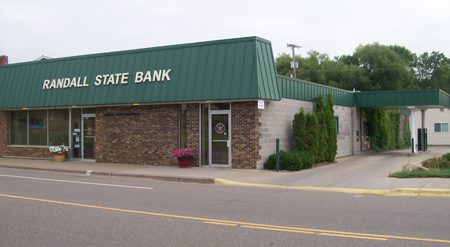 Find out what Randall State Bank can do for you here.